Quick question that I hope someone can answer for me. I was looking at the tan calf leather 'ostrich' straps for sale on Eddie's site and it's shown on what looks to me to be a cream dialled PRS-20 which looks absolutely stunning. Was this a prototype, part of the LE spec, an option or something like that? How many PRS-20 has been sold till now? The PRS-20 was launched in 2007 and almost 400 have been sold so far. Within a month, I think. Time to bend the misses ear for an early birthday present. I really can't wait for this to be released. Very exciting! I've ordered mine! Can't wait for it to arrive. My first PRS watch :). You have given a nice information about Italian PRS-20 Specs.I will like to add something that it has a manually wound movement Unitas and keeps excellent time. Crystal, bezel, sides and back are perfect with only some "swirl" on the back of the watch wear.The attention came with a leather case, but the zipper works properly and quickly I found . Instead I will travel case cover image below. The PRS-20 with the full lume dial looks also great. But I prefer the one with the normal dial. Last edited by soundood; 2nd June 2013 at 23:32. 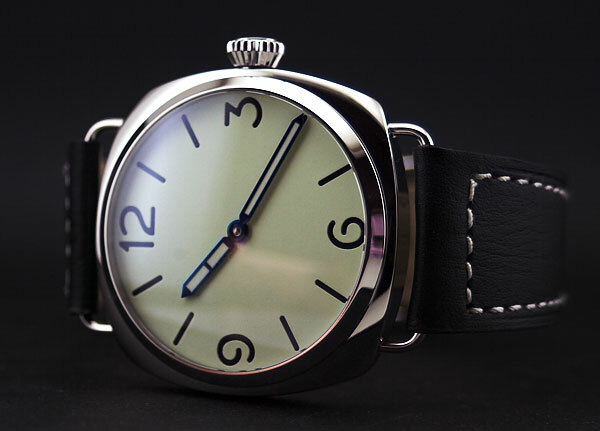 The full lume which has sold out. But the black dial version is available. The ETA movement winds like butter - get one while you can. I got a lot of interrest on this watch but something is retaining me, the hands. On Timefactors website, first pics, hands seems dark blue. On the others, light blue. Not really my taste. How do they appear in real life? Could someone post other pics please? I got a lot of interrest on this watch but something is retaining me, the hands. On Timefactors website, first pics, hands seems dark blue. On the others, light blue. Not really my taste. How do they appear in real life? Could someone post other pics please? There are plenty shots on the web, as always Google is your friend. Please note that some of the watches shown have been modded with replacement hands. Depends on angle of viewing. Dial seems to me too empty. A little "made in England" or a little second hand would have completed it nicely don't you think?